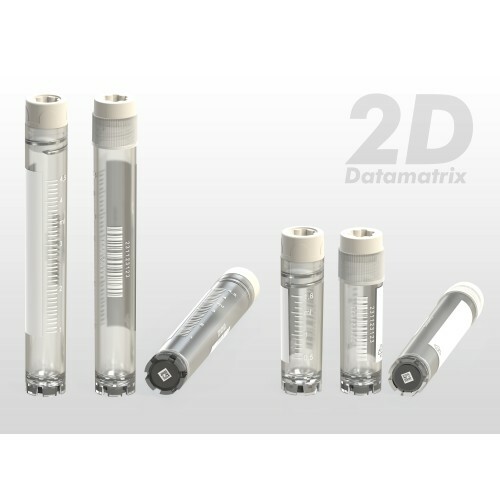 2D Datamatrix coded Cryogenic vials designed for storing cells, blood, serum and other biological fluids at temperatures as low as -196°C in sizes of 2 and 5 ml, internal and external thread cap. Innovative bi-injected cap where plastic and silicon parts are melted in a single body and ensures - No leaking - No contamination - Excellent screwing grip. 2D Datamatrix coded CryoGen® tubes are certified Human DNA, DNase/RNase/Pyrogen/ATP/PCR Inhibitors free, sterile SAL 10-6 and IATA PI 650. 2D Datamatrix Code - Datamatrix Code inserted in the bottom, sequential and corresponding to the "Code 128" on the tube body. 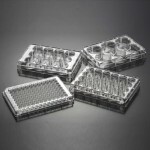 CryoGen® Tubes CLEARLine® are certified completely free of human DNA, PCR inhibitors, DNase, RNase, Pyrogens, ATP by an external independent laboratory. To download lot-specific certificate see the section certificate on the web site. CryoGen® Tubes CLEARLine®certified as STERILE were treated with a validated method to provide a Sterility Assurance Level (SAL) of 10-6. To download lot-specific certificate see the section certificate on the web site. CryoGen® Tubes CLEARLine® are produced from medical grade raw materials that will not discolor after re-sterilizing. Medical grade raw materials are certified USP Class VI, in accordance with United States Pharmacopeia and ISO 10993. 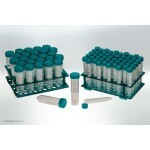 Test tube in medical polypropylene and cap in medical polyethylene/rubber. The combination of polyethylene stopper and test tube in polypropylene, makes screwing easier avoiding the grip effect caused by the use of the same raw material for both components. human readable characters printed in both left and right hand orientation for easy readability by all users. Datamatrix code inserted in the bottom, sequential and corresponding to the "Code 128" on the tube body. The 2D code is automatically generated from the linear barcode during the manufacturing process. Strict quality control, every tube is checked to ensure they meet our exacting standards of readings. The insert is secured in placeby the use of ultrasound to weld into place. 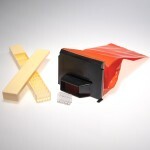 thermoplastic elastomer (TPV) layer and are 95kPa certified to provide a 100% leak-proof seal. 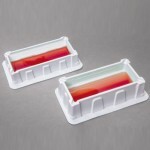 This proprietary molding process eliminates the risk of contamination associated with brands that use separate o-rings. 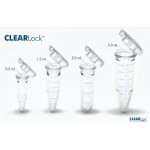 Self-standing vials interlock in workstations. 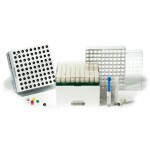 Locking base features prevents tubes rotating within the rack/workstation during capping and decapping. The base of the tube is provided with channels of evacuation of the cryogenic liquid that could possibly trapped between the base of the tube and the 2D pad. CryoGen® Tubes CLEARLine® tubes can be used as primary container for biological samples transport in conformity with packaging Instruction PI650 of the IATA regulations. The extractable study performed demonstrates that the analysed vials does nor release significant amount of inorganic elements and/or organic substances in ethanol. The integrity of the product and the packaging is resulted compliant after an accelerated aging of 5 years. Leak test, performed with the FORTEST ET99M-VOL to verify that the pressure charge is less than 0,2 mbar, as set. CE-IVD marked according to the directive on in vitro diagnostic medical devices 98/79/EC - other devices. CLEARLine® certificated Human DNA, PCR Inhibitor, DNase, RNase, Pyrogen, ATP free. Are CLEARLine® CryoGen® Tubes CE marked? 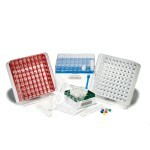 Yes, they are classified according to the directive of In Vitro Diagnostic Medical Devices 98/79/EC – other devices. 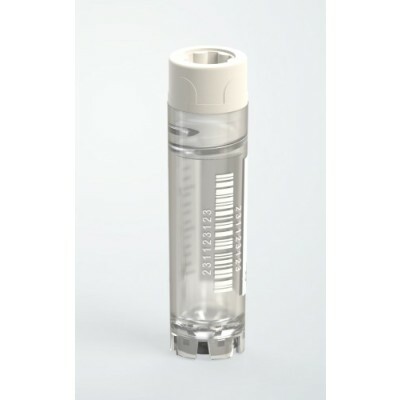 Are CLEARLine® CryoGen® Tubes be used in accordance with IATA regulations? Yes, they are. They can be used as primary container for the transport of biological substances (Category B) for air transport in compliance to packaging instruction PI650 of IATA. Are the CLEARLine® CryoGen® Tubes of all sizes and shapes free from any animal origin materials? Yes, they are. In plastic industry many of the polymers include small amounts of stearates derived from fatty acids, but for the manufacturing of CLEARLine® CryoGen® Tubes we do not use or intentionally add any ingredients of animal origin. Are CLEARLine® CryoGen® Tubes suitable for IVF? No, they are not classified for IVF (in vitro fertilization) or for working with human cells and human tissue which after frozen cycle applicable back to human. Do operators prefer to use internal or external thread cap version? Both closures are used in storage protocols without significant dominance of one in particular. Do the raw materials used to produce the CLEARLine® CryoGen® Tubes conform to USP Class IV, safe for use for biologics? Does the gasket (a thermoplastic elastomer) complies to the USP guidelines for elastomeric closures for injectable? Does Biosigma performs any Leak test on CLEARLine® CryoGen® Tubes? Yes, it does. After CLEARLine® CryoGen® tubes have been closed, they are positioned inside a specific container and subjected to a specific pressure to verify the perfect air-tight. The Leak test certificate is available upon request for each lot of production. For how long the CLEARLine® CryoGen® Tubes are certified as sterile? CLEARLine® CryoGen® Tubes are guaranteed sterile for 4 years from production date if the packaging is not damaged. Is it also possible to store CLEARLine® CryoGen® Tubes in the liquid phase of the liquid nitrogen or it must be done only in the gas phase? Storage in the gas phase is strongly recommended for security reasons. The immersion of CLEARLine® CryoGen® Tubes in the liquid phase may cause entrapment of liquefied nitrogen inside the vial and lead to pressure build-up, resulting in possible explosion or biohazard release. Is it available any testing on extractable or leeching performed on CLEARLine® CryoGen® Tubes? Yes, it is. 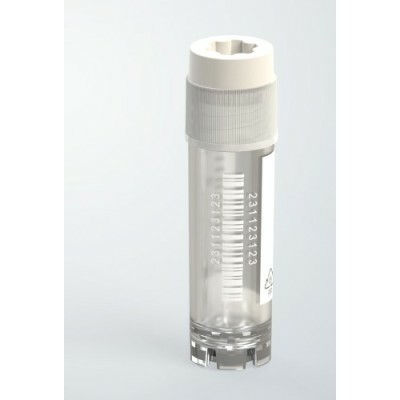 The extractable study performed on CLEARLine® CryoGen® Tubes demonstrates that the analysed vials does not release significant amount of inorganic elements and/or organic substances in ethanol. Is there a rule to consider for the CLEARLine® CryoGen® Tubes filling? The important thing is that the CLEARLine® CryoGen® Tubes are not being completely filled, as the liquid may burst the tubes due to the volume expansion caused by the freezing process. Usually laboratories follow the rule that the tube should always be filled up to two thirds. 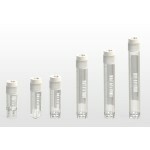 The ideal filling volume corresponds to the upper marking on the scaling of the CLEARLine® CryoGen® Tubes . Is there any documents where are indicated details and specifications on the method and process used to sterilize the CLEARLine® CryoGen® Tubes? It is available a certificate of sterilization where it is stated that our CLEARLine® CryoGen® Tubes are sterilized by beta rays. 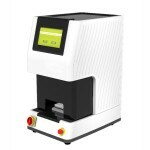 The sterility assurance level (SAL) defined and to be used in routine sterilization in accordance to EN 556-1 is 10-6. Certificates of validated Beta rays treatment are available for download on www.biosigma.com. 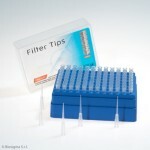 What is the security in sample management using a CLEARLine® CryoGen® Tubes 2D? 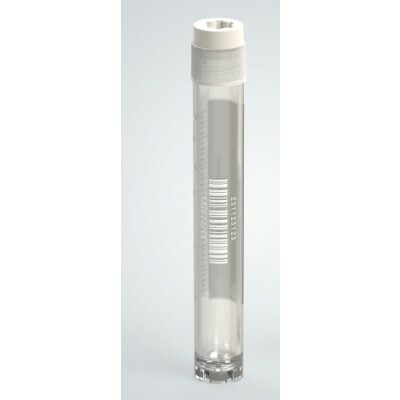 CLEARLine® CryoGen® Tubes 2D are uniquely identified by the Datamatrix Code inserted in the bottom and which corresponds to the “Code 128” on the tube body which allows you to track and trace your samples. The automated production system ensures that there is no repetition of the barcode in different CLEARLine® CryoGen® Tubes 2D as well as the correspondence between the Datamatrix Code and the "Code 128" on the same tube with the 100% production control of the pcs. What is the test-tube and cap material? 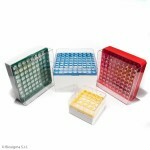 Test-tube is made in medical grade polypropylene and the cap is made in medical grade polyethylene/rubber. 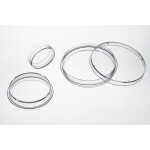 The combination of cap in PE and test tube in PP assures a better sealing and makes easier screwing. 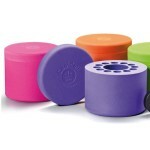 It avoids the grip effect caused by the use of the same raw material for both components. What should be considered when storing samples in liquid nitrogen? The storage of cells at temperatures below -130°C is essential in order to preserve the material unaltered. Many workers achieve that by the use of liquid nitrogen (at –196°C). The immersion of samples in the liquid phase may cause entrapment of liquefied nitrogen inside the vial and lead to pressure build-up, resulting in possible explosion or biohazard release. In order to prevent this, CLEARLine® CryoGen® Tubes should either be stored in the gas phase or they should be frozen and thawed inside an additional protective covering. So when dealing with liquid nitrogen, the following safety precautions should absolutely be taken: wear protective clothing, including protective glasses and cryogenic gloves. If the tubes should be removed from the liquid nitrogen without any protective covering, users should store them for 24 hours in the gas phase and then be removed safely. Which is that maximum speed centrifugation for CLEARLine® CryoGen® Tubes? The maximum speed centrifugation for CLEARLine® CryoGen® Tubes is 14.000 rpm. Which type of scanner can be used to read "Code 128" on CLEARLine® CryoGen® Tubes bodies? Which type of scanner can be used to read the Datamatrix Code of CLEARLine® CryoGen® Tubes 2D? The Datamatrix code of CryoGen® Tubes 2D can be read by all the scanners that you can find in the market. Since the Datamatrix code is very small an high quality scanner should be recommended. 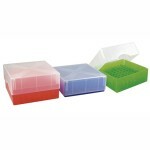 Barcoded Cryotube 2D 2 ml, internal thread cap, skirted, sterile, graduated, writing area, CLEARLINE®, Barcode Code 128. Dimensions: H 4,82 cm Ø 1,26 cm, 10 bags of 50 pcs. each. 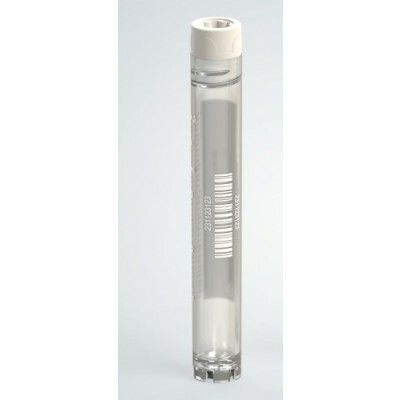 Barcoded Cryotube 2D 5 ml, internal thread cap, skirted, sterile, graduated, writing area, CLEARLINE®, Barcode Code 128. Dimensions: H 9,03 cm Ø 1,26 cm, 10 bags of 50 pcs. each. Dimensions: H 4,82 cm Ø 1,26 cm, 80 bags of 50 pcs. each. Dimensions: H 9,03 cm Ø 1,26 cm, 40 bags of 50 pcs. each. 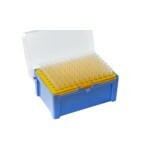 Barcoded Cryotube 2D 2 ml, external thread cap, skirted, sterile, graduated, writing area, CLEARLINE®, Barcode Code 128. Dimensions: H 4,56 cm Ø 1,26 cm, 10 bags of 50 pcs. each. 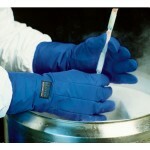 Barcoded Cryotube 2D 5 ml, external thread cap, skirted, sterile, graduated, writing area, CLEARLINE®, Barcode Code 128. Dimensions: H 8,76 cm Ø 1,26 cm, 10 bags of 50 pcs. each. Dimensions: H 4,56 cm Ø 1,26 cm, 80 bags of 50 pcs. each. Dimensions: H 8,76 cm Ø 1,26 cm, 40 bags of 50 pcs. each.